A couple of years ago, during Snowocalypse in Portland, the PRC Winter Series 5k ran on, a real testament to the runners of the Pacific NW. This year, we could not have asked for better weather during the race, which has the tagline “never let winter win.” Dare I say there was even SUNSHINE out there for the 2nd race of the series on January 12th, 2019. There were also 362 smiling finishers, which makes for an awesome turn out for a 5k! For the first race of the season, (which you can read about here,) I had the pleasure of running with Mina, who won our Run Oregon Sweepstakes. I saw her out there again, smiling and ready to go for round 2. 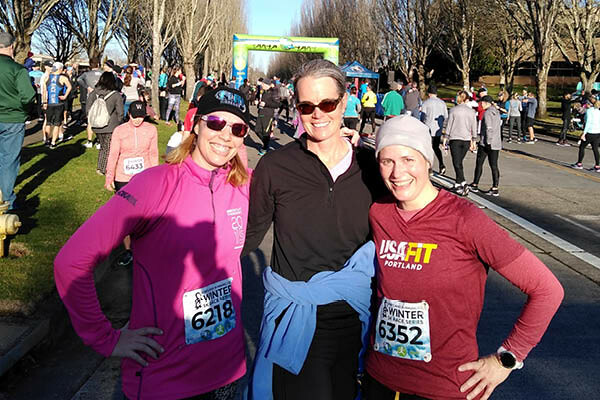 This time, I got to run with our 2nd contest winner, Megan Baker, along with Run Oregon founder and my good friend Kelly Barten, and we all had a blast. Kelly Barten, Megan Baker, and Nikki Mueller after the 2019 January 5k, the 2nd race in the PRC Winter Series. Like last month, I needed to get some extra milage in, so I got to Portland Running Company early and took off on a 12 mile loop around Beaverton. Afterwards, the store was brimming with good vibes, hot coffee, and bagels from Dave’s Killer Bread. There were some businesses there like Hello Fresh and Portland Fit, (which is a marathon training program I will be coaching with soon!) After getting warm in the store, we headed to the start line where we got another beautiful rendition of the national anthem by local runner Angela Niger, and some perky pre-race banter from Dave Harkin. Off we went. Megan had told us she was planning to run between a 9 and 10 mile pace, but like most people on race day, she was too excited to hold back. We ran probably a full minute faster than what we’d been advised but no one minded. It was a great day for it. (Kelly notes that our first mile was a super-speedy 8:43.) One of the nice things about this course is that it’s an out and back, so you get to see all the faster people come blowing by inspirationally fast, and you get to cheer your fellow runners on in both directions. The route is pretty short, sweet, and, true to form for any Run With Paula event, it was well marked and very organized. After the race, we got to experience another perk of a Run With Paula race, which is a terrific after-party. Not only was there more hot coffee (much appreciated to this early riser) but pizza and cinnamon twists from Dominos, plus cookies, oranges, bagels and cream cheese, and chocolate milk. It was a great spread and we still had a raffle to look forward to. The PRC raffle is excellent. Tons of hooded sweatshirts, socks, hats (I want one of those trucker hats SO BAD I might have to actually buy one after the 3rd race!) water bottles, camp coffee mugs, loaves of bread, and pint glasses are all handed out to lucky winners. The grand prize included a free Portland Fit entry. Score!! If you missed the 1st or 2nd race in this series, come to the final one on February 9th. The last one is the most challenging because no timing devices of any kind are permitted. If you’ve gotten used to always depending on your watch to tell you your pace and distance, here’s a chance to see how well you do without it. It’s a predictor race, so make a guess at your finish time and you could win something cool. The cost of the race is only $30 and it will be well worth the fun this event brings with it! Register here and I hope to see you in February!